We've a Fault with our Phone Lines. Sorry for any inconvienience cauased. Please call us on 01276 676 500 while we fix the issue. Paying too much for your Cleaning Supplies? Welcome to the A1 Cleaning Supplies website. We specialise in cleaning products and equipment supply and distribution. We have one of the most comprehensive ranges of janitorial products suitable for daily office cleaning; carpet cleaning; window cleaning and general contract and domestic cleaning supplies in the UK. We carry a complete range of hygiene supplies and cleaning equipment for home, commercial and industrial use. We are also major stockists and distributors of the Numatic range of machines including the world famous Henry Vacuum Cleaner. Please browse our online range of cleaning products to discover the savings you can make and how to order easily and quickly. If you require advice regarding cleaning tasks or cleaning supplies, then please phone our technical dept on 01276 676 500 (as 01276 685985 isn't working) or e-mail us and one of our experienced team will be happy to help and advise you. Sorry if you've had trouble getting through to us. We asked BT to cancel our fax line and instead they cut off all our lines. We've been strugging to get them to put it back and hope they will do this on Thursday. In the meantime, you can call us on 01276 676 500. SOME CHEMICALS WHICH MAY BE OF A HAZARDOUS NATURE CANNOT BE SHIPPED BY CARRIER. THESE MAKE UP ONLY A SMALL PROPORTION OF OUR CHEMICAL RANGE AND WE WOULD INFORM YOU OF ALTERNATIVE PRODUCTS WHEN AN ORDER IS PLACED. We can provide C.O.S.H.H. data sheets for any chemicals that we supply. This child's size version of the ever popular HENRY vacuum cleaner. Includes removable dust box and full set of cleaning accessories, even a dustpan and brush. Requires 4 X C batteries. IT REALLY WORKS TOO. From £16.50 + VAT. The real thing! 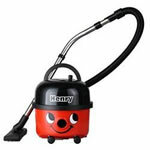 HENRY NRV vacuum cleaners available in four colours with 12.5m rewind cable & 2 yr warranty. Low prices for your Black Refuse Bags! From £30.00 + VAT per 1000. Yellow hi-viz jackets, bombers and vests. Jackets and bombers, class 3 reflective, quilted and stormproof, from £16.95 + VAT. Also class 3 reflective vests from £5.95 + VAT. IT IS IMPORTANT THAT YOU READ ALL THE TERMS OF TRADING ON THIS WEBSITE.